Here I attempt to document a particular bit of noodling I did on the subject once. There are diagrams and pictures that should go along with it, which maybe I'll get around to drawing or otherwise creating. In particular, I tried to reconcile to myself two descriptions I'd used/heard in proofs and discussions regarding hyperspheres. 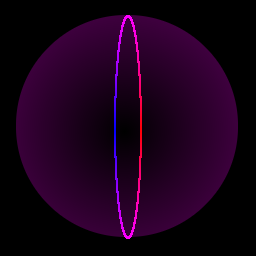 One (I think from Ian Stewart's Flatterland ) involves picturing successive 3-D slices as spheres of varying color: the fourth dimension runs from blue to red (through purple), and as we shift our slice-plane in one direction, the big purple sphere gets smaller and bluer, and going back the other way it grows back to its full purple size and then keeps getting redder as it shrinks again toward its center. Now try doing the same task with the surface of a 2-dimensional ball , i.e. a circle. A fuzzy circle can easily have its hairs all combed down: just comb them all around it clockwise (or counterclockwise). As the Mathworld link above will tell you, it turns out this is possible whenever the number of dimensions is odd, but not when it's even. 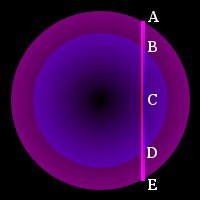 (Remember, the ordinary 3-dimensional case counts as even, because we're dealing with the 2-sphere S2, and the 2D circle is odd because it's S1. Those wacky topologists.) So you can comb down the hairs of a fuzzy 4D hypersphere (which is good to know if you ever get a job as a barber in four dimensions). And that theorem is what the lecture I attended was about. The lecturer actually proved the general case, for all n, and when giving the background and bringing up the 4D case as an example, he quickly explained it was possible, since after all, a 4D hypersphere is equivalent to two circles: one in the east/west × north/south plane, and one in the up/down × blue/red plane, and you can comb each circle around like we said before. And that makes sense, sort of... but how does it jibe with the multicolored sphere from the other model? Specifically, what do these two circles look like on the multicolored sphere? That's what I'm trying to reconcile here.